As a followup to yesterday's post, I've aggregated all the free OSR fantasy RPGs that I'm aware of into a single page. It's permanently tabbed at the top of this blog. I've wanted an aggregator page ever since I started hunting down free OSR manuscripts. Since I never found one, the time seemed right to build my own. If one already exists that I've missed, someone please steer me toward it. This is a work in progress, and I'm not an expert on everything out there. I'll try to keep the page up to date and expand it with new links and additional categories as time and resources permit. Let me know if something has been overlooked, described incorrectly, doesn't belong on the list, or if any of the links are misbehaving. Hey - that's pretty handy. Thanks! Nice work. FYI there is a free version of LOTFP minus art. Not quite the same thing, but here is a link to a useful thread at Dragonsfoot (though some of the links need updating): Publishers & Products. Yeah, there are probably over 100 clones and variations at this point (I have most of them). But I'm afraid you have discovered the OSR just as the funeral rites have begun. Last year saw a massive drop out of old schoolers (and blog closings) and a deluge of game systems to the point where every review started reading the same way-'Do we really need another D&D?' and 'It's a nice enough system... I wouldn't switch over to it but I would salvage parts for my own game table'. So the OSR has went from being a revival and renewal of old school gaming to a junk yard where you drop in to see if there are any mechanics you can shoe horn into your own personal fantasy heart breaker. With most of the major figures in the scene now taking a paycheck or perks from WotC so they will say nice things about their latest abomination it has pretty much turned into a joke. The OSR was a reaction to what Wizards did to D&D and now they are lining up like beggars at a soup kitchen to get a bowl of 'stone soup'. I appreciate your input, but I disagree with a couple of your statements. Rather than let people interpret silence on my part as tacit agreement, I'll point out where our opinions differ. I don't think the OSR is near the ironic joke or funeral rites stage yet. There is a glut of rules, with more arriving every month. Some of the newer entries, however, are stepping away from OD&D. The three that come immediately to mind are DCC, LotFP, and Secret Fire. Certainly there's no doubt about who their father is, but they're not clones. They contain unique strains of DNA. I also question whether the OSR was a reaction to WotC's treatment of D&D. People who disliked D&D 3rd and 4th had the perfect reason to be drawn to the OSR, but they're not the sole fans. I'm not convinced they're even the majority. I know plenty of people who play old and new D&D, and plenty more who simply prefer the old without hating on the new. Anecdotes like that are interesting but not informative. Since no one can say even how many people are involved in the OSR, it's equally impossible to say how many of them are or aren't fans of other games. A lot of people are asking whether or not we need another D&D, but their answers take the form of entirely new games. Sure, they usually maintain the basic old-school D&D mechanical framework, but the point of their creation isn't to just perfectly duplicate or to house-rule tweak the game. It's to create games that go in directions that the original text never explored. Lamentations of the Flame Princess aims for weird gothic fantasy, ACKS wants to emphasize domain-building and the PC endgame, DCC wants to do gonzo D&D-turned-to-eleven, my own Stars Without Number wants to do sci-fi sandboxing... all of these games may share B/X bones, but they're all aiming in fundamentally different directions. I can't think of an OSR game released in the past year that was simply "My house rules in a fancy cover". All of them were trying to do something more than just be a "better D&D". I don't consider any of these games to be failures if a DM simply grabs some rules or setting or ideas out of them. That's really the /point/ to it. Almost all of us are speaking essentially the same mechanical language, and we're conveying ideas that can be expressed by any DM in his own home game, so why /shouldn't/ he just yoink the bits he finds most fun and useful? The OSR has given us a context and a lingua franca to convey our ideas in forms that other people can easily remix and interpret for their own games. Thanks for chiming in, Kevin. This topic has been on my mind a lot lately, and my thoughts on it keep going round in ever widening spirals instead of narrowing down to a conclusion. Currently at least, I'm leaning in this same direction. Most of these games are labors of love, and those follow their own marketing rules. Thought you might want to include Adventures Dark and Deep in your list. 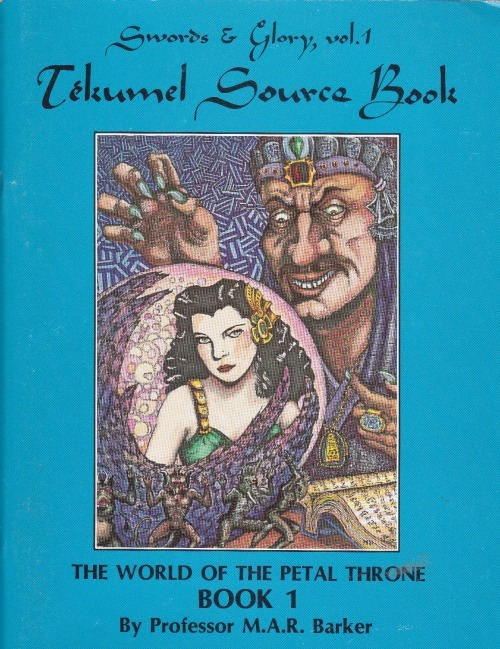 It explores what AD&D might have looked like if Gygax had continued to work on it in the mid-1980's, based on his statements at the time and afterwards as to what he wanted to do with it. Thanks for the new links, those of you who provided 'em.